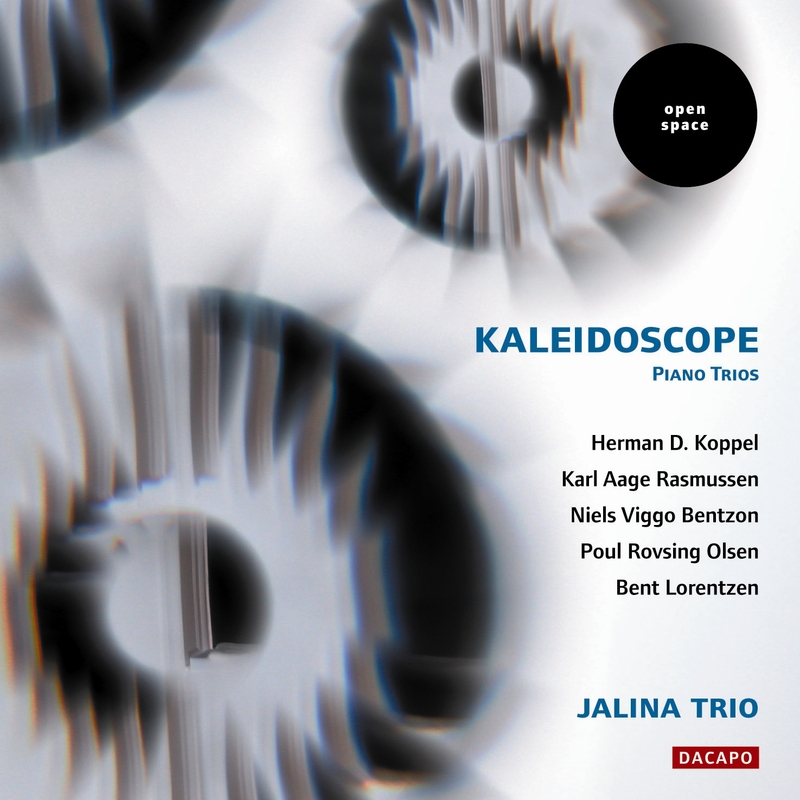 Jalina Trio klinger allerede velkendt i de flestes ører, ikke mindst efter at trioen modtog DR P2-prisen/DMA Klassisk sidste år for sin indspilning af romantiske klavertrioer. På Jalinas første Open Space-udgivelse retter trioen blikket mod en håndfuld nyere danske værker, og her bliver den klassiske klavertrio til et kalejdoskop, som reflekterer moderne dansk musik på fornemste vis. I Henrik Friis' essay her på siden kan du læse meget mere om de fem komponister og deres værker. Allegro, con leggerezza 3:25 6,40 kr. Vivace, sempre con leggerezza 3:03 6,40 kr. Tema con variazioni: Andante, con grazia 5:18 9,60 kr. Toccata: Vivace, con forza 3:11 6,40 kr. Trauergondol (1998) * 8:43 9,60 kr. Moderato, ma non troppo 6:02 9,60 kr. Adagio - Presto - Adagio - Presto - Adagio - Moderato - Adagio - Presto - Adagio 5:34 9,60 kr. Allegro vivace - Meno mosso - Tempo I 5:44 9,60 kr. Contours (1978/2002) * 14:05 12,80 kr. Bartókian folk melodies of the fully singable kind. Each of the four movements works with such a melody as a kind of theme, but in very different ways. While the first and second movements display the thematic material con leggerezza, with lightness, and in fragments, the third movement consists of seven fundamentally different variations on the theme. In duration they range from ten seconds to one and a half minutes, in character from expressive folklore to diabolical grotesques. The last movement reveals yet another aspect of the material in a tour de force where the piano fills in all the possible quavers that the good three minutes of the piece can hold. Karl Aage Rasmussen's (born 7) Trauergondol draws its inspiration from Franz Liszt's piano piece of the same name, La lugubre gondola, written after a visit to his daughter and her husband Richard Wagner in Venice in 1882. The story behind the work is that in a nightmare Liszt saw the ailing Wagner's funeral procession sailing through the canals of Venice, and wrote the piece to exorcise the vision. Rasmussen remains loyal in his recomposition of Liszt's work. Both have the low register acting as the musically-painted gondola in rocking movements from gently splashing waves to dramatic storms. The high register - in Liszt the right hand on the piano, in Rasmussen the strings - sings melancholy melodies. But Rasmussen's work is not like Liszt's. His own music sounds throughout the work in the form of the tempo variations and note displacements that make the work seem like one long line running from the low to the high and back to the low, before the concluding melancholy coda. In that sense the work is all his own, inasmuch as the tempo work - eternally accelerating (of course an auditory deceit!) - is a thoroughly Rasmussenesque invention. As a pianist, author and composer with more than 650 works to his credit Niels Viggo Bentzon (1919-2000) had a quite crucial influence on Danish musical life. His works are as a rule recognizable to anyone who has heard just a couple of pieces from Bentzon's hand - para-doxically enough, since he has worked with the whole palette of the art of music: in the 1930s inspired by Carl Nielsen, Bartók and Neoclassicism; in the 1940s by German Expressionism; in the 1950s by Vagn Holmboe, metamorphosis and dodecaphony; and in the 1960s by the Fluxus movement etc. Nevertheless there is something highly personal that recurs throughout and binds all Bentzon's compositional phases together. Something distinctly Bentzonesque in the tone. Trio quattro is gentle music, romantic in a sense, but still with the Bentzonesque mechanical repetitions - a residue of the Neoclassical. The second movement is if possible oriented even more towards remote romantic regions than the first, but in the same slightly floating, melancholy tone. And once more, as a contrast to the foregoing, Bentzon's humour does not fail him in the quick, very short final movement. Over the predominant triplet motif Bentzon has notated a rhythmically correspondingOh-Ka-tha-ri-na\, presumably as a more straightforward, personally longing comment on the music he has produced. Trio II from 1976 is a good example of the methods and styles that Poul Rovsing Olsen (1922-1982) - ethno-musicologist, lawyer, critic and organizer in the musical world - absorbed into his music over the years. Three elements are crucial: sonority, where notes are emphasized for their sound, not their harmonic context; systematic structure, where sections succeed one another like beads on a string in a kind of -mechanical metamorphosis; and foreignness - usually rhythmic - where the pulse is regular with a few displacements which can be traced to what is at all events a non-western inspiration. As can be heard immediately in the first movement, Rovsing Olsen practices a tonal minimalism, but at the same time a maximalism of sonority. The music takes its course systematically in self-contained sections, where rhythmic patterns and figures range in sonority from delicate string harmonics to the marked rhythmic motifs - actually ostinati - where the parts comment on one another in a wealth of sound-effects such as echoes, contrasts and colourings. The second movement offers a folk-music-like string passage with appropriate pathos, developing almost mechanically into expressive atonality. The activity is still minimal, the music transparent and ‘thin-sounding', and all the entrances equally central and completely audible as delicate gesticulations. In the concluding movement we get power: a piano ostinato in the bass drives the music forward, and takes us through various stages until a frenetico section takes over with an increasing confusion of the mechanics of the three parts, before the work ends - delicately once more - with an expressive string coda. Bent Lorentzen (born 1935) is probably best known as a composer of music drama. Nevertheless, we have a succession of very important electronic and instrumental works from his pen. Among biographical events crucial to his compositional training one must mention, after due training at the Royal Academy of Music in Århus, his participation in the holiday courses in Darmstadt in the mid-sixties and his later period at the EMS electronic music studio in Stockholm. This must be why the electronic approach has become central for Lorentzen - for in his acoustic music too it is the sonorities of the instruments that are explored as if they were in a mixer console. At the overall level Contours is just what the title suggests: that is, contours of music in a kind of timbral variation work that dwells in detail on the special colours of the instruments - in the sense that for Lorentzen the timbre must be what lies ‘at the edge' of the sound of the instruments. A fragile introduction leads into a long, trans-parent melodic concatenation, first for the piano, then for the strings. The music is without pulse, the bar lines have gone, and only the individual note relates to its successor in an overall rhythmic indefinability much in the same way as in the work of Olivier Messiaen. The second passage, on the other hand, is rhythmic, with real bars, yet in a tempo that turns the previously lingering into something gushingly, escalatingly hectic. The third passage again dwells on a variation, the fourth is hectic again, but this time moving towards a demented ending in rhythmically marked, virtuoso runs all over the instruments.